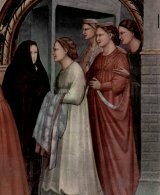 1 Giotto di Bondone was a painter of the early Renaissance. He was one of the first of a long line of artists who brought painting out of the Middle Ages and into a new era. In doing so, Giotto and the other Renaissance painters created a style that has been an inspiration for artists ever since. They brought art into the modern age. 2 Paintings of the Middle Ages were almost always of religious subjects. They were painted in a stiff, formal style. The people in those paintings, usually religious figures, did not look realistic. 3 Giotto painted religious subjects, too. In fact, his most famous work is a series of paintings that covers most of the interior of a church. However, there is a difference between the works of Giotto and the works of the Medieval painters who came before him. In one word, Giotto's paintings were lifelike. 4 According to one story, Giotto had a gift for painting lifelike pictures from an early age. According to this story, Giotto, at about the age of 12, was out in the meadow on his family's farm painting pictures of their sheep. A Florentine painter, Cimabue, noticed Giotto's pictures and was so impressed that he talked Giotto's father into letting Giotto move into town and become his apprentice. 5 Near the end of his apprenticeship, Giotto traveled to Rome with Cimabue where they worked on a large project being built there, the Church of St. Francis of Assisi. There, it is believed, Giotto worked on frescoes for the new church. Frescoes are paintings done on the walls of churches and other buildings, often in a series. At that time, they were painted on the wet plaster walls. Frescoes were not easy to paint because the painting had to be finished before the plaster wall dried.